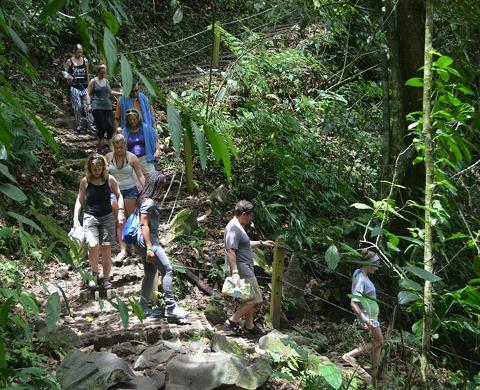 Arenal COMBO Chocolate Tour La Fortuna Waterfall HikeTwo of the best secrets in Arenal. 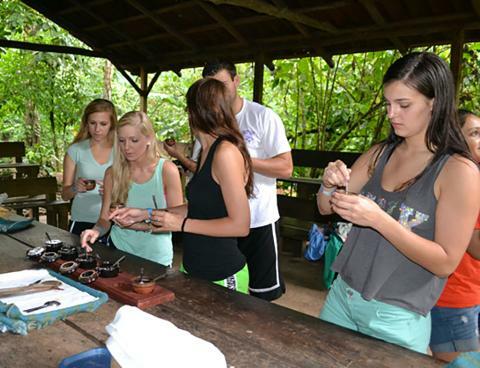 Arenal Combo Tour 2 in 1: Chocolate Tour & La Fortuna Waterfall Hike. 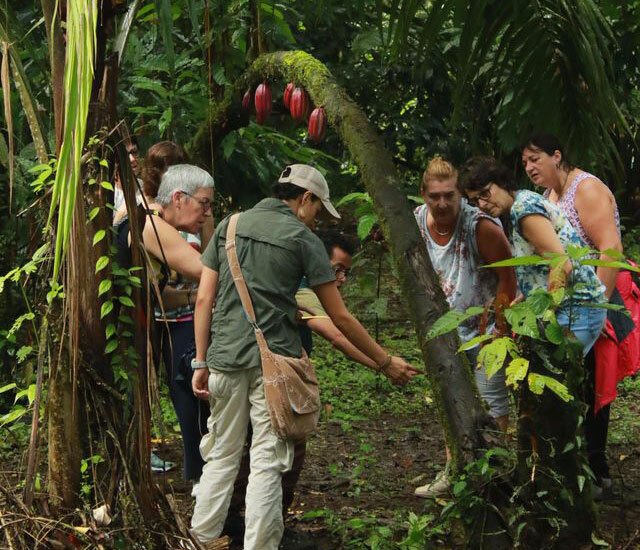 There are so many things to do near the Arenal Volcano, we thought we’d combine two of what we consider some of the most interesting activities in Costa Rica: a nature hike to the La Fortuna Waterfall and a fabulous chocolate tasting tour! 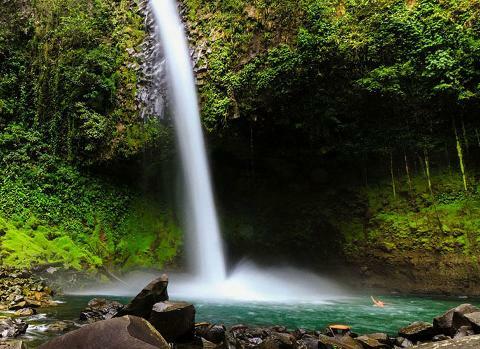 Your naturalist guide will pick you up from your hotel and take a fun drive up a country road to the breathtaking 150-ft La Fortuna Waterfall. Once we arrive to the base of the extinct Cerro Chato Volcano, we’ll hike down to the bottom of one of the largest waterfalls in the Northern Zone. The hike is about 300 steps to get down a well-maintained path, and 300 steps to get back up! Its quite a good workout! While you are down there, and if conditionas warrant, you can swim in the crystalline pools that flow from the impressive waterfall and take advantage of some beautiful photo ops! Soak up the nature, birds, rainforest, and enthralling sounds and sites of this enchanting La Fortuna attraction. It is truly amazing there -- Mother Nature at her best! When you come back up from the waterfall and change into your dry clothes. 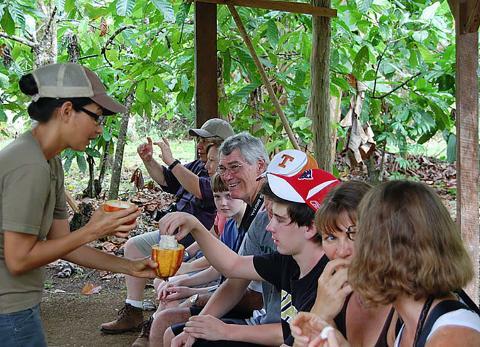 When you are relaxed and refueled, we will head down the road to the cacao plantation to learn about the chocolate making process, and get to taste some freshly made chocolate! Have you ever seen where cacao comes from? While in their pods, cacao beans are actually covered in a delicious fruity pulp that you can snack on before roasting the bean. Yum! After learning about the process and history of chocolate making, you’ll be impressed to find out what REAL chocolate looks and tastes like. This kind of chocolate has a wide range of health benefits so don’t feel guilty about eating a lot of it! This is one of Desafio's favorite COMBO Tours. And here at Desafio, we are fanatical about our love of chocolate and have even made our own chocolate bars in conjunction with local chocolatier Chocolate Fusion. Be sure to stop by our office to buy a souvenir Desafio Energy Fix Dark Chocolate bar!